In 1991, “The Silence of the Lambs” did what no other horror film had done. It won the three major Academy Awards – Best Actress Jodie Foster, Best Actor Anthony Hopkins and Best Picture. The movie deserved every bit of it. 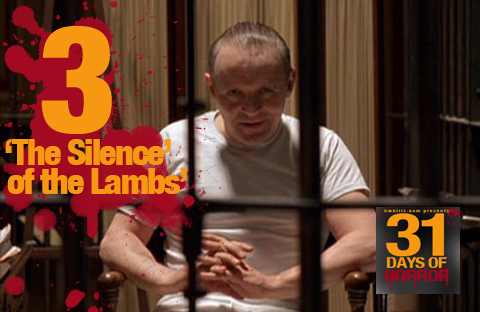 The third movie based loosely on the cannibalistic murder Ed Gein, “The Silence of the Lambs” tells the story of FBI agent Clarice Starling (Foster). She’s on the hunt for a killer named Buffalo Bill by the media. He earned that name because he skins his victims. Seeking answers, she goes to get some advice from convicted killer and cannibal, Hannibal Lecter (Hopkins). Lecter doesn’t quite come through, as he spends most of Clarice”s time messing with her head. Some of the movie’s best scenes are between the two of them. What makes that worth mentioning is that nothing horror-movie like happens during their scenes. The movie switches to a psychological mind f***. Cut back to Buffalo Bill. His actions are what makes up most of the horror aspects of the movie. He has captured his next victim and is keeping her in a hole in his basement. He’s starving her so that when he skins her, it will be loose enough to wear. She is to be the latest contribution to his woman suit. Bill is one creepy killer. Eventually, Lecter tricks the FBI into transferring him so he can manage his escape. Just as Bill is caught, Lecter escapes. One killer is caught, while a (perhaps) more dangerous one is free. Hopkins is surely the star of the movie. He is absolutely amazing as the genius psychopath. Foster plays well off him as the vulnerable, yet determined young agent. Did You Know? The movie is not only based on Ed Gein’s story. It’s also based on killers Ted Bundy and Gary Heidnick.